Ascending Butterfly: Winner Announcement - One Meaning Couture Signature Butterfly Pendant Winner! 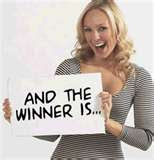 Winner Announcement - One Meaning Couture Signature Butterfly Pendant Winner! Congratulations to *'JenButterfly12' winner of Ascending Butterfly's One Meaning Couture Signature Butterfly Pendant Giveaway! Join us in congratulating our winner. We would like to thank our sponsor One Meaning Couture for this great giveaway. We look forward to working with you again soon! Congrats to the winner JenButterfly12.